It’s the 9th anniversary of my publisher, Less Than Three Press! 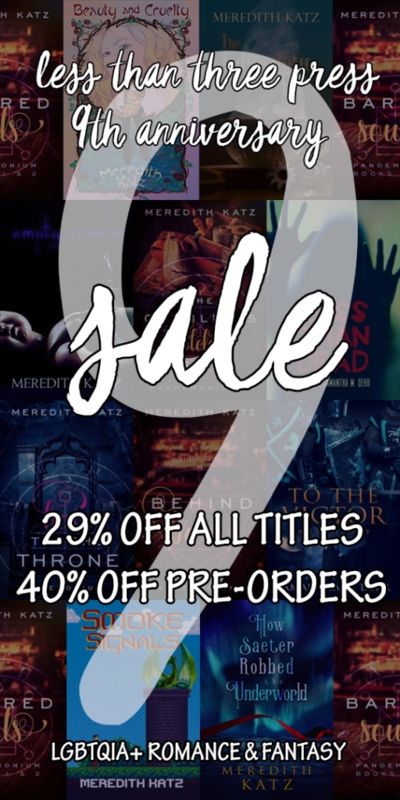 All their books are 29% off right now–and, when added to the usual preorder sale, that adds up to a whopping 40% off! As well, every book you buy from their Book Market in the month of April will give you an entry to win great prizes! Learn more about the LT3 9th anniversary celebrations over here. More interested in shapeshifting demons and the humans they love? Try my Pandemonium series (1&2 star bi humans with nonbinary demons, and the 3rd is a F/F story with with two human heroines, one cis, the other trans). All between are $1.50-3.50 right now! Or maybe you want some themed stories? I’m in two anthologies – a F/F story in To The Victor, a collection about knights, and a M/M story in Less Than Dead, a collection about zombies!